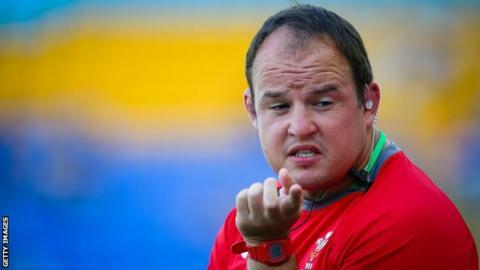 Wales Sevens head coach Gareth Williams will join the national squad for their upcoming summer tour. Williams replaces Cardiff Blues coach Danny Wilson, who withdrew last week. Williams joins head coach Robin McBryde, defence coach Shaun Edwards, and regional coaches Stephen Jones (Scarlets) and Matt Sherratt (Cardiff Blues) for next month's two-Test tour against Tonga and Samoa. Williams has overseen two sevens Challenge Trophy victories. Wales will announce their squad on Tuesday, 9 May. "I feel honoured and excited with the challenge ahead in supporting Robin and working with the other coaches," said Williams. "The opportunity to learn, collaborate and show what I can offer is very exciting." Wales head coach Robin McBryde said: "We've been very impressed with Gareth's work with Wales Sevens, winning silverware this season with a very young group of players."